The pioneer settlement of Springfield began when John Kelley, his wife Mary, their five children, and John’s brother, Elisha, arrived in the area in the spring of 1819. The next year, they built the first cabin at what is now the northwest corner of Second and Jefferson Streets in 1820. Other pioneers from North Carolina, Virginia, and Kentucky followed, taking advantage of the area’s fertile soil and trading opportunities. In 1821, Zachariah Peter, William Drennan and Rivers Cormack drove a stake in the ground at a point in the prairie near John Kelly’s field and Springfield was officially born. A trail traveling past John Kelly’s cabin brought supplies to the settlement from the Illinois River and soon became Springfield’s first street, called Jefferson. The town was first named Calhoun after Senator John C. Calhoun of South Carolina. In the same year, a man named Elijah Iles opened the first store on Jefferson Street, purchasing goods from St. Louis, Missouri and having them brought to Springfield. School was first taught in a log building during the winter of 1821-22. Located on a hill on the north side of Washington Street, between what is now Pasfield and Lewis Streets, Andrew Orr was the town’s first teacher. Like most pioneer settlements, it took no time at all for taverns to spring up, the first of which was opened by Elijah Slater in 1822, where travelers were provided with food, drink and a place to stay. Two more taverns quickly followed. In 1830 the Methodists built the first church in the burgeoning community and the Presbyterians opened a new brick church just one month later. In 1832, Senator John C. Calhoun, for whom the settlement was named, fell from public favor and the town’s name was changed to Springfield. The town was officially incorporated on April 2, 1832 and by by 1835, Springfield had grown enough that the Board of Trustees saw the need for law enforcement and a constable was appointed. 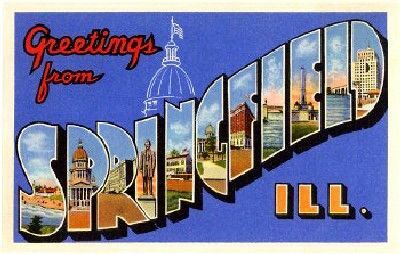 In 1837, due in large part to the political maneuverings of a young politician named Abraham Lincoln; the state capital was moved from Vandalia to Springfield. On April 15, 1837, Lincoln moved to Springfield from nearby New Salem and began practicing law with John T. Stuart, a prominent Springfield attorney. Before Lincoln moved to Springfield, the young man had tried his hand at a number of endeavors, including clerking at Denton Offutt’s store in New Salem, becoming a postmaster, a surveyor, and a law student, before running for the state legislature in a losing campaign. In 1834, he was elected to the legislature on his second try. It was during this term in office that he influenced the placement of the State Capital in Springfield. During Lincoln’s time in Springfield, he had three different law partners, the last of which, eventually became his biographer. He spent many days riding the Eighth Judicial Circuit and practicing in county court houses all around central Illinois. 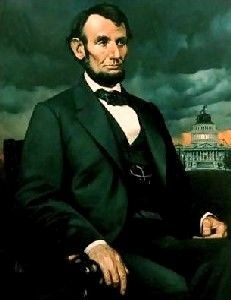 Practicing law providedLincoln with the status and visibility that contributed to his success in politics. In 1840, Lincoln met a Kentucky belle named Mary Todd, and after a stormy, sporadic courtship, the couple was married by the Reverend Charles Dresser in 1842. Their first son, Robert Todd Lincoln was born on August 1, 1843. The next spring, Lincoln bought the Reverend Dresser’s home on the corner of Eighth and Jackson streets for $1,200 cash and a small lot worth $300. The Lincolns occupied this brown frame house for the next 17 years. While practicing his profitable law career, Lincoln continued to be active in politics and on November 6, 1860, he was elected president. 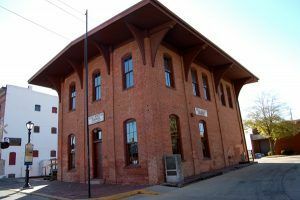 The Lincoln Depot in Springfield, Illinois, Kathy Weiser, October 2010. Click for prints & products. He left Springfield that day and would never return during his lifetime. Though the Civil War took many men from Springfield in the fight for the Union, it also boosted Springfield’s economy with numerous new industries and businesses. With its State Capitol status, the town continued to grow. 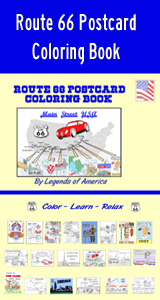 When the Mother Road came through Springfield, the town responded with even more businesses targeted to the many travelers of “Main Street USA.” Gas stations, cafes, and motels sprang up overnight. When the Route 66 signs came down in January 1977, many of these longtime businesses died the inevitable death of being by-passed by the superhighway. However, many of these old icons still stand in this proud city, and Springfield is dedicated to the memory of its rich history, including the Mother Road. When you first enter Springfield on the north side of town, you’ll see the Pioneer Motel with its neon sign at 4321 N. Peoria Road.